Are you visiting Curazao in Cruise ship? 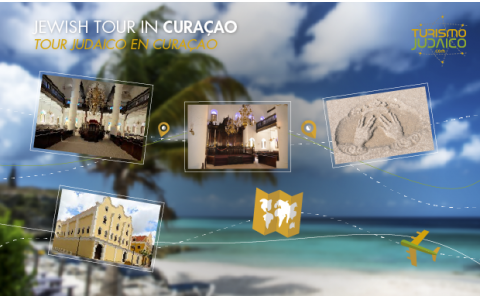 We can offer you an amazing shore excursion to learn about Jewish life in the island, visiting the most important and simbolic Jewish places. Curazao is recognized by being one of the oldest historical sites about Jewish life, in this part of the hemisphere. The historic Synagogue Mikve Israel - Emanuel, is the oldest synagogue in the Americas in continuous use, since 1732 and is recognized worldwide for its sandy floor. In addition, Beth Haim Cemetery, consecrated in 1659, is the oldest Caucasian cemetery on the island and in the Western Hemisphere, and a site nominated as a national monument on Curazao. Will also visit the Mongui Library, the largest library and archives on the island. This site belongs to a private foundation. This Jewish Tour is carried out by a member of the local Jewish community, a specialized guide, who has been touring for many years. * The Liquor Factory of Curacao, "Blue Curacao". own creation and that also has Licor Kosher. * A tour of the old quarter of the Sephardic Jews, between 1850 and 1970. * and other meaningful jewish places. ** It takes, at least, 7 working days to book the service prior to the date of the tour. * Bilingual guide (Spanish / English), member of the local Jewish community. * Pick up from Cruise Dock. The architecture in the Scharloo area, accesible by crossing the Wilhelmina Drawbridge, on the other side of Waaigat, dates back to the year 1700. It is the old Jewish neighborhood. In 1651 Joao dYlln requested the Company of the West Indies Netherlands the possibility of establishing a company to colonize Curaçao. Joao was a good and prosperous member of the Portuguese synagogue in Amsterdam and had a brother who was a colonel in the Dutch colonial army. The aim of the company was the preservation and development of their power in the distant Caribbean island. Both the boss and his group, all from Amsterdam, (at that time a center of flourishing Jewish life and culture) left for Curaçao in the summer of 1651 and founded the Congregation Mikveh Israel (Expectancy Israel) the oldest Jewish congregation in the Americas. In 1659, a further 70 Portuguese Sephardic ancestry departed for Curaçao, carrying the first Sefer Torah. It also acquired the "Beit Haim Blenheim" Mikveh Israel Cemetery Congregation , considered by many to be the oldest Jewish cemetery in the Western Hemisphere, and established in 2001 as a historic site. The Jewish community of Curacao Netherlands Antilles became very successful in the areas of trade and shipping. In 1732 the historic Mikve Israel was built. With the merging of Temple Emanuel in 1964, name of synagogue changed into: Mikve Israel-Emanuel. The first Eastern European Ashkenazi Jews families arrived in 1920. Although small in size, Curaçaos Jewish community has a significant impact on history. * 25% Shaarei Tsedek , a modern Orthodox community. Curaçao is the largest and most populous island of the Netherlands Antilles. It has an area of ​​approximately 444 km and a population of 140,796 (2008). It is located in the southern Caribbean Sea, about 50 km from the west coast of Venezuela. Like most of the Caribbean islands, Curaçao is located in the intertropical zone and its climate is semiarid. Curaçao is located in the non-hurricane belt. It is famous for the "Curaçao Liqueur" that is made from the bark of the oranges of the island, and for celebrating one of the most famous Carnivals in the Caribbean. The city of Willemstad is the main port and capital of the island, in addition to also be of the Netherlands Antilles. Its historical area, city center and harbor, were declared World Heritage Site by Unesco in 1997. It has two official languages​​, Dutch and Papiamento.